Most of you must have heard about Matcha green tea and its benefits. However, very few of you know about it in details. Matcha green tea has been in use in the Japanese culture for centuries. It is considered to be one of the best in terms of quality powdered green tea you will find in the market. Matcha green tea is made from the young tender leaves of Camellia sinensis plants. These leaves are rich in various nutrients. These tender leaves are steamed, stemmed, and then de-vined in order to be stone-grounded into fine powder form. The powder is later stored away from oxygen and light so that the antioxidant properties and the brilliant green color of the powder is preserved. As discussed above, Matcha green tea has been used in the Japanese culture since ages. Here are some of the benefits you can enjoy if you have it on a regular basis. Rich in Antioxidants: All of you probably know about antioxidants. These are enzymes and nutrients that work like a charm and are highly responsible for fighting against various negative effects of the harmful UV rays. It also helps you retain your younger looks by taking care of your skin and helping your body prevents the effects of various life-threatening maladies. According to tests, Matcha green tea is said to be almost 5 times richer in antioxidants than any other food source. Loaded with EGCg and Catechin: It is good for you to note that not all types of antioxidants are created equally. In green tea, you will find a specific type of organic compounds better known as catechins. It happens to be highly potent and beneficial amongst all varieties of antioxidants. EGCg, which is a type of catechin, comprises of almost 60% of the entire volume of catechins in Matcha green tea. This type of catechin is highly recognized for its ability to fight against cancer. 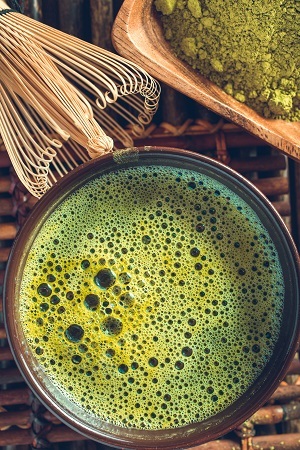 Helps You To Remain Calm: Japanese Zen Buddhists and Chinese Daoists have used Matcha green tea for more than a millennium to help themselves meditate and relax while remaining alert at the same time. This is possible due to the presence of amino acid L-Theanine, which is present in the leaves, which are used to make the Matcha green tea. This form of amino acid is helpful in the production of alpha waves in the human brain. These waves help you to relax without making you feel drowsy. Helps You In Concentrating And Boost Memory: L-Theanine also produces serotonin and dopamine in your body. These chemicals are helpful in enhancing your mood, boost your memory, and also help you to concentrate better than before. This is rather beneficial for every person. Boosts Your Overall Endurance And Energy Levels: All of you must have heard about Samurai warriors. These Japanese medieval age warriors used to drink Matcha green tea before any battle. It used to energize their bodies and make them feel rejuvenated. 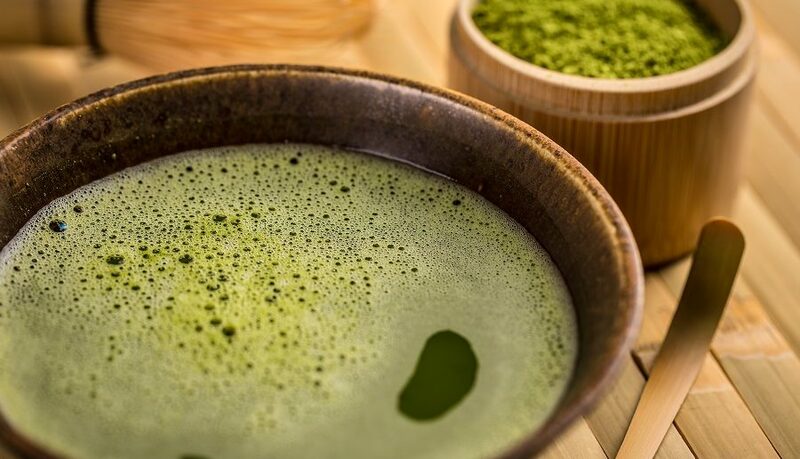 Although caffeine is present in all types of green tea, the boost in energy levels after consuming Matcha green tea is primarily due to the combination of caffeine and other nutrients. The boost in your endurance levels after having a bowl of Matcha green tea can easily last up to a maximum of 6 hours. All of these is possible without any side effects such as hypertension and nervousness. Burns Calories: One of the key benefits of having Matcha green tea on a daily basis is its ability to boost your metabolism. As a result of this, your body easily burns fat approximately 4 times its normal rate. Thankfully, there are no side effects of having Matcha green tea every day, such as high blood pressure and increased heart rate. Helps To Detoxify Your Body: Once the tea leaves are harvested in order to be made into Matcha, the Camellia sinensis is not allowed any sunlight. As a result of this, the amount of chlorophyll content in the leaves increases. This gives the bright green color to the Matcha green leaves. Matcha also happens to be a powerful detoxifier, which is capable of getting rid of heavy chemical toxins and metals from your body in a natural manner. You will probably come across several manufacturers of Matcha green tea in the market. However, not all of them are equally reputed and reliable when it comes to their products. One of the best in terms of Matcha green tea product quality is Cuppa Tea. The company chooses the finest teas, which are handpicked from the Nishio Region of Japan, and assembles them to manufacture their very own Matcha green tea. The product made by Cuppa Tea is non-GMO and 100% organic without any harmful additives. Their Matcha green tea products are also double checked by 4th generation tea masters. The Matcha green tea made by Cuppa Tea is available in 4 different flavors. The company provides free samples of these 5 different tasting Matcha green tea, which you can taste and then decide which one to finally, choose for your daily drink. The free samples provided by Cuppa Tea include Premium Matcha (2gm trial pack), Premium Vanilla (6gm trial pack), Premium Raspberry (6gm trial pack), Premium Blueberry (6gm trial pack), and Bakers Blend Matcha (4gm trial pack). Each package 1 serving and the serving size is 1 cup. The cost of the product and packaging is entirely on the manufacturer. However, you will just have to bear the cost of shipping which is $2.99. If you wish to have Matcha green tea, it is very important that you take some time and choose a product made by a reliable manufacturer. Trying the trial packs of Matcha green tea made by Cuppa Tea will help you get the feel of their quality and also find out which taste you prefer. It is important for you to remember that the benefits from having Matcha green tea will not happen overnight. You need to give it some time.